You don’t just ask this question straight out. You ask yourself, and you pick up the answer by sensitively and attentively listening to the person’s story. Any reports of concentration difficulties, memory changes, mood alterations, sleep disturbances…others? The same biology (neuroimmune, endocrine and other systems) that underpins persistent pain can also powerfully effect memory and learning. 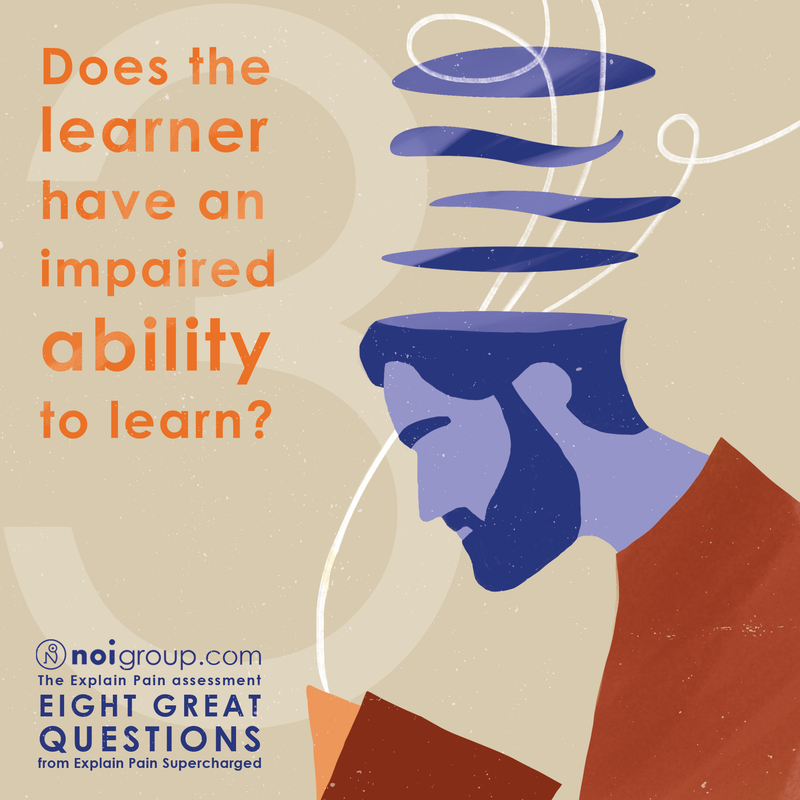 No flow charts, algorithms or ready made answers here – be ready to adapt and individualise your educational intervention for the person in front of you. Go back and check understanding (theirs and yours), acknowledge, keep listening, be interested in the individual’s whole story. I’ve been trying to use an initial 90 minute unstructured phenomenological interview for people with complex pain ie fibromyalgia. 95% say “no” and want a 45 minute interview and physical treatment. Therapists are bound by cultural expectations and I need to earn a living. I find those that take it benefit from it greatly and trying only to actively listen and not to be thinking of gems of answers makes the process very interesting for me too. However even 90 minutes is paltry and cannot possibly tell the story of a life led.I think a good interview and education are healing layers but we tend to get overly fixated by novel concepts and think that it will change everything, when it might help a little. For example CBT and meds plus exercise (the current gold standard of treatment ) only give 10% of FMS sufferers improved outcomes to their complaints over a lifetime. I feel we either need to think outside the (mirror) box or accept some things for some people never change. Pain is inevitable, but perhaps its suffering that we can alter.